Choice of venue for a holiday party, anniversary, corporate party. in order to celebrate a wedding, anniversary, birthday or a corporate need to pick up a place of the event. This can be a restaurant, club, café, open area outdoors, if the event is held in the summer. If you are going to sit in the close family circle, it all comes down to your preferences on price and service quality, and preferences for design and interior. Well, if you are going to organize a significant event with the invitation of a presenter, a DJ, various artists, show ballets, music band for a corporate event, you will need a room with an area of over 100sq. meters. the First thing you should pay attention to the space in the hall. You will need to put guests to leave the dance floor, you will need space for movement of the waiters and the guests and also to leave room for musicians and performances by various artists. For guests to calculate the place is not difficult, per person approximately 1.5 - 2 square meters. More difficult with the musicians. For the musical band, the scene, or if there is no scene - a dedicated area on the floor. You ask: "what kind of math?" Answer: "If you are not comfortable to be musicians or artists to be on stage, the performance will be held with great tension and frustration and this may inevitably affect the quality of the performance. And as a consequence on the occasion." Host. He needs to walk around the room, so I need to leave free aisles between the tables for guests and in General it needs to easily move. His task is to move quickly from one point to another easily and quickly. Actors. Whether it's magicians, bubble show, dancers, etc. they will need quite a few, they will not stand still and will move. Accordingly we must proceed from 3Q. meters each. the Most common mistake made by many not to turn on the acoustic properties of the hall any attention. How many times our group came to the yard, and there was such a strong reverberation (in a simple language - the echo) that could clap your hands and hear a three-second sound reflection. the calculation of the most popular dance songs tempo is 120 BPM (or 2 blows per second), imagine how many times the same the sound is repeated and superimposed later on, when accounting for 5-6 musicians produce sounds. These platforms are very good for Opera singing or an acoustic concert. And for a music band with a drum kit in their composition or disco is not suitable. Sound will turn into porridge regardless of the quality of the equipment! The fun doesn't get any listeners or musicians. as soon As you want to choose a room for your event take the time to go there and clap your hands a couple of times. If you can't hear the echo of claps it's just wonderful, and if you hear it is worth considering the suitability of the hall for live sound. 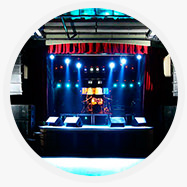 If you are unable to determine the quality of the sound, then you need to appeal to those who will do the sound design of your event, whether distributors of sound equipment or musical group. Well, maybe you liked the room and you are not interested in its sound properties, you can try to mute the reflections some flooring on the floor (carpet, carpet, etc.). And on the walls to hang fabric curtains or similar materials. General reflections arise from the straight walls and corners, the more room smooth surfaces - the more reflection. Well, the more different curves, furniture, rugs, shaggy, absorbing sound vibrations, etc., the reflections of the sound is smaller and as a fact more clear music. a must-have item in the room should be a dressing room and utility room. Leading artists and musicians need somewhere to change, to be waiting for its release on stage. You also need storage room for cases from instrument, musical instruments, and the like. If there is not enough space in the room, you can set up a tent in open areas, but if in the winter only indoors and it is desirable to monitor the presence of a really warm room. There were times in winter when our team was placed a very cold dressing room onstage to play was simply not possible and this greatly affected the quality of performance and mood. the Search space for the celebration not so easy as it might seem at first glance. Of course you will be guided on their own preferences, pricing, distance from the centre of the city, availability of Parking, etc. But please do not forget that there is another side of the issue outlined above. And if you take into account when selecting a site, the festival will be able to accurately! sincerely, cover band "Orange VINIL"!